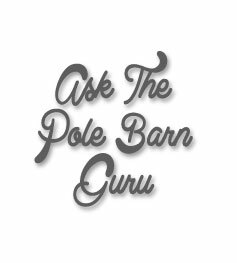 Today the Pole Barn Guru answers questions about adding a garage door wall to a hoop shed, ventilation with no sidewall overhangs, and how post frame buildings are “anchored” to the ground. DEAR JOHN: With no building behind to tie an endwall into, it would be structurally unrealistic and economically unaffordable to build what would essentially be a billboard in front of your hoop building. 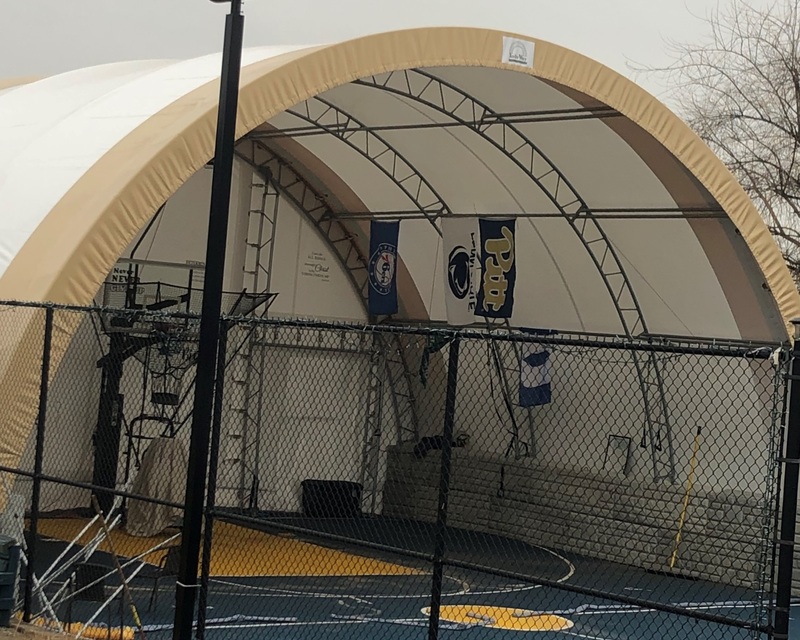 We would recommend tearing down the hoop building and replace it with a new post frame building which would be structurally sound and a permanent structure. 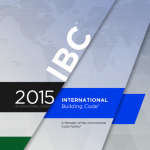 2015 IBC (International Building Code) ventilation requirements may be accessed here: https://codes.iccsafe.org/public/document/IBC2015/chapter-12-interior-environment please see 1203.2. In areas closest to sidewalls, use closed cell spray foam insulation until you reach an area where full depth blown in fiberglass insulation can be used (20″ will provide recommended R-60 for your area). 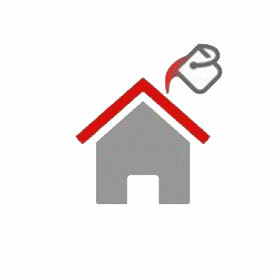 Or – use no vents and closed cell spray foam underside of roofing and triangles of gable ends. 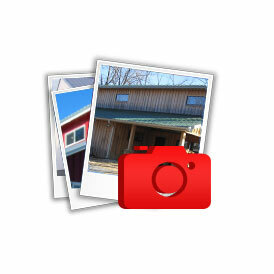 DEAR CARLOS: Pole barn (post frame) buildings are indeed anchored down – or least most should be. In our case engineers we utilize will specify a bottom collar of a minimum 18 inches diameter and 16 inches deep, at base of a 40 inch or deeper hole. Columns will be attached to a slab on grade, or restrained by an elevated wood floor, if over a crawl space. There should be no more damage to plumbing, due to an earthquake, for post frame construction, than there would be for any other form of construction. This entry was posted in Pole Barn Design, Building Overhangs, Ventilation, Footings, Overhead Doors and tagged Ventilation, pole barn footings, footings, Hoop shed, wall materials, IBC code on March 18, 2019 by admin. Bigfoot Systems® bills itself as North America’s Original #1 Selling Pier Footing Form, which I would say is most likely 100% or more correct. So, what exactly is a Bigfoot and why would one use one? Before we get carried away, I have never used a Bigfoot and this is not a celebrity endorsement. This article began with Hansen Pole Buildings’ Designer Greg Lovell asking me what I thought of the system. Bigfoot is a footing form which is used to form a pier base under a cardboard construction tube (think Sonotubes: https://www.hansenpolebuildings.com/2013/11/sonotube/). Unless one wants to make a significant investment in concrete filling a very large diameter tube, it is more economically practical to increase the size of the footing (maintaining a smaller diameter tube) in order to properly distribute the downward forces over an adequate surface. 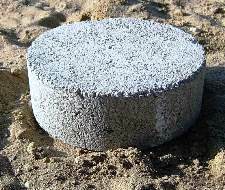 In a previous article we shared why it takes a fairly large footing to spread the weight out (read more here: https://www.hansenpolebuildings.com/2012/08/hurl-yourconcrete-cookies/). There are some limitations as to the “smallness” in diameter of the cardboard tube. 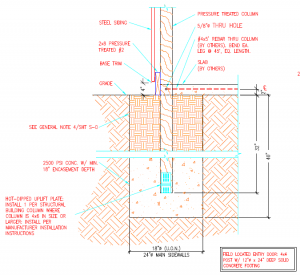 In cases with concrete encasement around an embedded column, Code requires a minimum of four inches of thickness of concrete on all sides of a column. The diagonal measure across a nominal 6×6 (actual 5-1/2 inch by 5-1/2 inch) column is just under eight inches, meaning the smallest possible Sonotube would be 16 inches in diameter. While Bigfoot comes in 20, 24, 28 and 36 inch diameters. 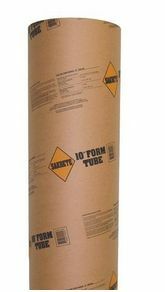 Only the largest size will accept a tube over 12 inch diameter. I am certain Bigfoot offers advantages for many types of construction, especially with decks. For post frame construction, in most cases it appears as if it would be added effort and expense. 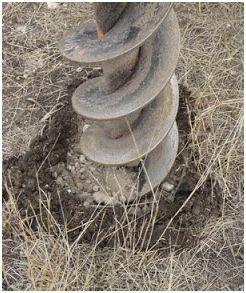 In order to be utilized with an embedded column, a 36 inch diameter or greater hole would have to be dug – and rarely are auger bits this large readily available. The only true practical case I could make for the use would be if one had soil which collapsed as the hole was being dug – thereby forming a crater. This entry was posted in Pole Barn Design, Pole Barn Structure, Concrete, Footings and tagged pole barn footings, footings, sonotubes, pier footing, pier base, embedded columns on May 16, 2018 by admin. Having spent two decades directly involved in the prefabricated metal connector plated roof truss industry (with titles running from just above the janitor, to owner of two plants) steel truss plates have always fascinated me. From Pro-Footer® comes the UP-Lift plate, which is an ingenious adaptation of truss plate technology. They are designed to help save time, money and meet or exceed post uplift requirements. The affordable plates are field applied to opposite sides of an embedded column, with just a framing hammer. No special tools are required. The numerous metal teeth of the plates ensure a firm attachment to wooden columns. The galvanized coating of the UP-Lift plate ensures extra protection and long life. Once the UP-Lift plates are positioned, the columns can be placed in the augured holes, braced and the hole backfilled with concrete as specified by the RDP (Registered Design Professional – architect or engineer). The accepted bond strength of concrete to wood is 30 pounds per square inch (read more at: https://www.hansenpolebuildings.com/blog/2013/04/pole-barn-post-in-concrete/). In the example in the article, a 4×6 (3-1/2” x 5-1/2”) column surrounded on the lower 10 inches with concrete would provide the ability to resist 5400 pounds of uplift force from the connection itself. This condition is known as a “bottom collar”. For those who are taking the short version of the course, the result is a pair of UP-Lift plates attached to the column provided 8888 pounds of uplift resistance, or 164% of the concrete only design solution. Before looking at the UP-Lift plates as the total “solution” to uplift issues, a complete and detailed analysis of the column embedment should be undertaken by an RDP, as many other factors influence the system’s ability to withstand uplift forces. These include (but are not limited to) design wind speeds and wind exposure, soil bearing capacities, building dead weight as well as how the area of the column above the concrete lower collar is backfilled. Unsure of the ability of concrete to bond to wood? Then UP-Lift plates may be the solution for you. Please note, this product does not carry an IBC ESR approval, so may not be accepted in all Building Department jurisdictions. This entry was posted in Concrete, Footings, Columns and tagged pole building foundation, pole barn footings, pole barn uplift, pole building uplift, Pro-footer on May 8, 2014 by admin. I really, really enjoy interactive clients. The ones who pay attention to what is going on (chances are, if you are reading this, you are one too). They help keep me on my toes, as well. I’ve never used the product John found, so this is a good time to check it out. Before digging into the SquareFoot™ concrete footing forms, an examination of the standard pole building footing would be in order. One of the beauties of pole barn construction is it is fairly low tech in the field. Holes are augured into the ground (most typically using a skid steer), usually to a depth of either 40 inches, or greater if needed to get the bottom of the footing below the frost line. Unless an attempt is going to be made at dropping a pre-formed chunk of concrete into the hole (aka cookie) to support the columns, the hole itself becomes the form for any poured concrete. Columns can be placed, suspended above the bottom of the holes, and premix concrete monolithically poured to flow beneath the base of the column (as a footing) and up the sides of the column (as a bottom collar). 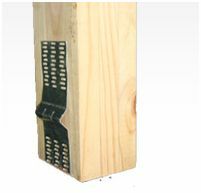 The premise behind the SquareFoot™ concrete footing forms is to eliminate the need for wooden footing forms. They are a unique, patented square footing form which provides a one-step process for excavation, backfill and pouring concrete. As a simplified description – a hole is dug with a backhoe or mini-excavator, and the SquareFoot™ is placed in the hole with a construction tube inserted (aka Sonotube®). For pole building construction, a pressure preservative treated column would be inserted into the tube and suspended in the assembly, then premix concrete would be poured in. Having built plenty of footing forms, in my younger days, I can see the advantages of the SquareFoot™ for typical residential and commercial stick frame construction. For pole buildings, I just am not feeling the love (and the soundfootings.com website does not show post frame as an application). Why add the expense of a plastic footing form and a construction tube, plus the time and effort needed to place, when the nicely augured hole, does everything needed? Add to that – my largest concern structurally comes with filling in around these forms with dirt. If they are not compacted to the density of pre-excavated soil, there is a propensity for lateral motion of the columns. 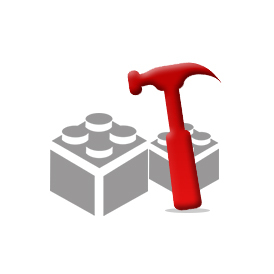 So there is more work again – having to refill dirt around the concreted columns and having to tamp…tamp….tamp! With a monolithic concrete pour into a cleaned out augured hole, once the concrete is poured, you are done! This entry was posted in Concrete, Concrete Cookie, Footings and tagged pole building foundation, pole barn footings, pole building holes, sonotubes on March 19, 2014 by admin. 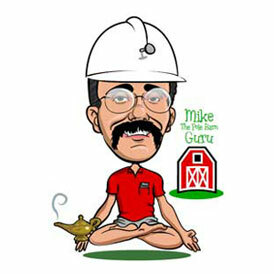 Dear Guru: Why is My New Pole Barn Quote Much Higher? DEAR SARAH: I have to admit, this question on your pol barn quote had me initially stumped, until I looked back at the history of quotes you had received from us. Back in 2011, you asked for a quote on a fully enclosed 60’ x 120’ x 12’ building, with a 12’ wide roof only shed along one side. This pole barn quote included features like a 3’ wide insulated commercial steel entry door, with factory painted steel jambs; a 12’ wide x 11’ tall all metal framed sliding door; polycarbonate eave lights on both 120’ sidewalls; a polycarbonate vented ridge; and roof insulation. Recently, you asked for a new pole barn quote for a roof only 40’ x 60’ x 12’ building, with a 12’ wide roof only shed along one side. The only other features were the vented ridge and a cupola. Your first quote was three times the square footage, included a sliding door, eavelights, poly ridge vent and roof insulation….and all sides of the main building were fully sheeted with steel, fully trimmed out. This is a lesson in why trying to compare price only, ends up being nothing short of confusing for all involved. For you, or any client, we will happily compare any quotes, to make sure all is apples-to-apples. DEAR RESEARCING: With the relatively low roof load, you could monopitch scissor truss the side shed, but will probably get a maximum of 1.5/12 slope, unless your client can stand a parallel chord truss which would be about 3 feet deep. If so, then he could have 4/12 slope inside and outside. With trussed vaulted ceilings, placing unfaced insulation batts between the ceiling joists will be the most effective method of insulating. DEAR MOPAR: Good questions. And can be addressed with several answers. First – what is it the embedment of the column really has to do? It must resist uplift, overturning and settling. Next – there is absolutely nothing wrong with properly pressure preservative treated wood in contact with concrete. In fact, the Building Codes require it! Filling holes with sand is not going to prevent frost heave – the sand provides no resistance to heaving. The sand also does nothing to address the crucial issue of uplift (the building wanting to be sucked out of the ground). As to your second concern, you take the load and divide it out across the roof area. I am guessing your posts are not every 24”, but rather the trusses. Whether you have single or double trusses – it ALL gets transferred into the number of posts at whatever spacing you have and then down into the ground. Regardless of how the trusses and posts are spaced, you need a concrete footing large enough to distribute the load. I am not talking about concrete cookies, which I talk about in older blogs. What I am referring to is a monolithic concrete collar around every post designed to support the loads. As to your concern about the roof loads being transferred through the columns and into the ground adequately – regardless of how the trusses are spaced, the columns carry the roof’s live and dead loads, multiplied by one-half of the truss span (plus any overhangs), times one-half of the distance to the next adjacent columns (in both directions). DEAR CHILLIN’: I am going to take a stab at your reference being to knee braces supporting roof trusses, as this would be the most likely answer. In the case of an angle brace supporting any other horizontal member, the greatest dictate as to if it is effective or not is typically the adequacy of the connections. In most cases, the brace ends up being a waste of time and materials. This entry was posted in Pole Barn Questions, Concrete, Footings, Budget and tagged pole barn footings, pole building holes, monopitch trusses, pole barn price quote, pole building price quote, post embedment, prices on pole buildings, shed vaulted ceiling on March 10, 2014 by admin. Ask the Pole Barn Guru: Can I Build on Bedrock? Can I Build on Bedrock? DEAR BEDROCK: My first recommendation would be to contact the engineer who designed your building. Often times, a larger diameter hole can be utilized to offset the lack of depth. In the column embedment calculations, the depth of the hole is squared, while diameter is not, so (depending upon the design wind load) you may end up with some fairly large holes. If the original design does not call for the holes to be backfilled with concrete, you should consider doing so with these two, to prevent uplift issues. If you opt to try for a lesser depth, you should also discuss with your building official. In the end – if the Building Inspector ain’t happy, ain’t nobody happy. Me – I’d probably be out there with a jack hammer. DEAR GNASHING: While the bedrock may appear to be exactly what it is, you might want to consider having a Geotechnical Engineer take a look at it, to determine if indeed it actually is adequate to support a building. Assuming the bedrock is adequate, there are brackets we can provide which can be used to anchor buildings to solid rock (they are actually designed to attach columns to existing concrete foundations or floors). When you put in a request for a quote, make sure to let us know the circumstances, as well as the amount of grade change from high point to low across the rock. This entry was posted in Pole Barn Questions, Pole Barn Planning, Footings and tagged pole building foundation, pole barn footings, anchor brackets, pole building holes on June 17, 2013 by admin. Client calls into our office at the end of the day Friday and talks with Sheila. He tells her his Building Official will only accept his new pole building construction with holes 48 inches deep, with a six inch thick concrete cookie in the bottom of the hole, and no concrete backfill around the columns. The building is a commercial pole building 34’ x 60’ x 13’ in Iowa. Because it is a commercial building, the client purchased engineered plans for the building, which includes all of the supporting calculations for the design. While a hole for a pole building post might seem to be just a hole in the ground, lots of things are happening below the ground. The embedment has to be deep enough to put the bottom of the footing below the frost line. The footing beneath the column has to be large enough in diameter to keep the building from settling. The design must also provide for the resistance for uplift. In this particular building, the downward load on the footing is just over 5400 pounds. The uplift force is 1120 pounds. Now it is 4:50 on Friday afternoon, so I ask for the phone number for the Building Department, client instead, has me call him…..now the Paul Harvey appears…. The issue turned out to have absolutely nothing to do with any Building Official, and everything to do with the client’s builder (I know, a shock). The builder insists upon digging the holes with the 12-inch diameter auger he has mounted on the back of his farm tractor. He refuses to set the posts in concrete, because if he doesn’t get a post in the right place, he wants to be able to move it around in the hole. His idea is to dig a four foot deep hole, and drop a 12-inch diameter concrete cookie in the bottom of the hole! I can foresee a myriad of potential problems coming up, even without breaking out my Ouija board, or shaking the Magic 8 Ball. Problem Numero Uno – if these holes are approved by the field inspector, someone is either blind, or an envelope got passed. If the Building Department accepts anything which is contrary to the engineer sealed and approved plans, they have opened themselves up for an entire world of liability. Assuming somehow they are able to pass the hole inspection – a 12 inch diameter concrete cookie covers roughly 0.76 square feet of surface. Applying a load of 5400 pounds to it, means the soil bearing capacity would need to be somewhere in the neighborhood of 7000 pounds per square foot (psf). Table 1804.2 of the International Building Code gives a value of 4000 psf for sedimentary and foliated rock and 12,000 psf for crystalline bedrock. Neither of these types of soil would be touched by the 12-inch farm tractor auger. The probability of settling issues on one or more of these columns – right darn close to 100%. The diagonal distance across a 6×6 (actual dimensions 5-1/2” x 5-1/2”) is nearly eight inches. Those 12-inch diameter holes better be pretty much spot on and perfectly plumb, or there are going to be some very interesting looking walls (as in not very straight at the ground line). Builder does not want to backfill any of the holes with concrete (builder says it will also rot the posts) to prevent uplift. With a hole this tiny, there is no way to even begin to attach an uplift cleat to the sides of the columns. There is also no way to adequately tamp compactible materials into the space between the column and the sides of the hole. A registered design professional has designed this pole building. He has years of experience and has designed literally thousands of successful buildings. At his fingertips are the most powerful computer design programs. This design is nothing short of a work of art. The resultant, we have the Mona Lisa being whitewashed over by a builder with a farm tractor. This entry was posted in Uncategorized and tagged pole building foundation, uplift forces, pole barn footings, pole barn uplift on November 6, 2012 by admin.